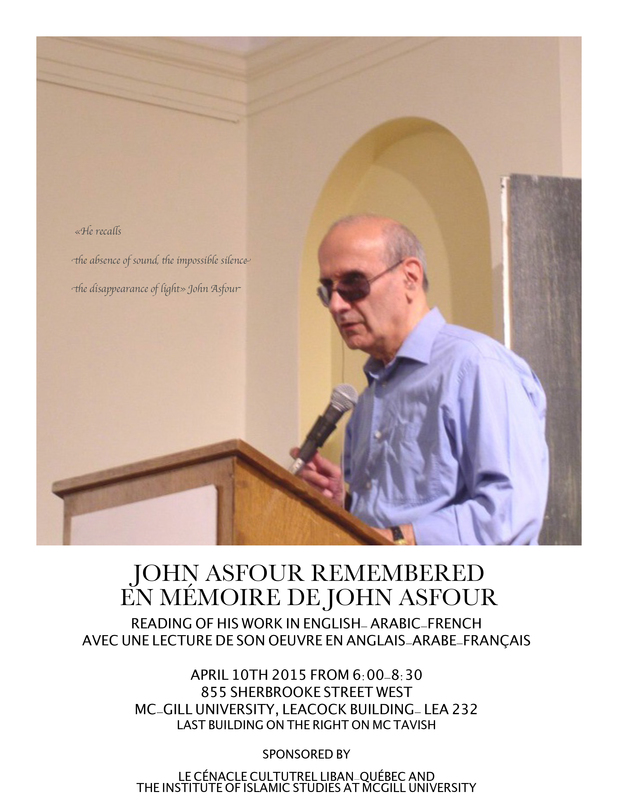 On April 10th the Institute of Islamic Studies at McGill University and The Lebanon-Quebec Cultural Forum will be hosting a reading in memory of poet and professor John Asfour, who passed away on November 2nd, 2014. Asfour was also the editor and translator of When the Words Burn: An Anthology of Modern Arabic Poetry; the co-author of Joy is Not My Profession, a collection of select work of poet Muhammad al-Maghut; and the translator of Nadine Ltaif’s The Metamorphoses of Ishtar, published by Guernica Editions in 2011, and Faraj Bayrakdar’s Mirrors of Absence, which will be published by Guernica Editions in Fall 2015. The reading will take place at McGill’s Leacock Building (855 Sherbrooke St. West), Room 232, and will include readings of Asfour’s work in English, Arabic and French. All are invited to attend and celebrate the life and work of John Asfour. Tagged with in memory, John Asfour, Poetry, reading.